Jim Furyk leads England's Justin Rose by one shot after a six under second-round 64 at the PGA Tour Championship. The American sank seven birdies in his first 10 holes while joint overnight leader Rose (68) improved to six under. World number one Rory McIlroy is four off the lead at the halfway stage after sinking a 25-foot eagle putt in his 68. Overnight co-leader Tiger Woods finished on one-under after a three-over round of 73 that included a double bogey at the par-four eighth. Woods started his second day of the season-ending tournament by dropping a shot on the first after pushing his approach into a bunker. Birdies at the third and seventh both came despite again driving into sand. The recovery work was undone, however, by a double bogey on the eighth followed by four further dropped shots on the back nine. While Woods had one of his more erratic days, Furyk's progress was comparatively serene. The wildcard pick for David Love's US Ryder Cup team, which tees off in Chicago next week, could have set an even more imposing score but for dropped shots on the 13th, 16th and 18th. 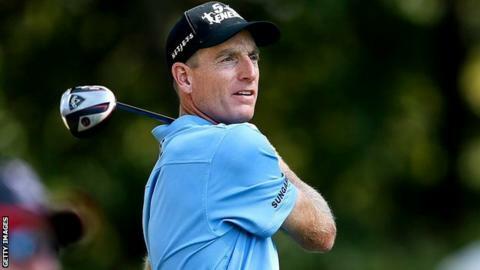 Furyk, 42, won the FedEx Cup and its $10m (£7m) bonus in 2010 but while he leads the tournament, it is McIlroy, who is joint seventh overall, who leads the race for the bonus. The Northern Irishman, who has won three of his last four competitions, eagled the 15th to ensure he carded a 10th successive sub-70 round. Rose, playing alongside Woods in the final pairing of the day, held his nerve to keep up the pressure on Furyk, sinking a birdie on the final hole to limit the gap to a single shot. Fellow Englishman Luke Donald shot a 69 to move to level par, while Lee Westwood followed eight bogeys in his opening round with a three-over 73 on day two to finish 28th overall. Four American contenders lie just behind Furyk and Rose. Bubba Watson and Bo Van Pelt are tied third at five-under after a four-under round of 66 for Watson and a Van Pelt run of six birdies in nine holes. Justin Johnson and Matt Kuchar are tied for fifth at four under. The PGA Tour Championship is the final tournament in the FedEx Cup play-offs with Woods and McIlroy both seeking a victory that would ensure them the £7m bonus on offer.